I've been seeing a lot of Magic Cakes on the web since March...and honestly, I wasn't so interested. 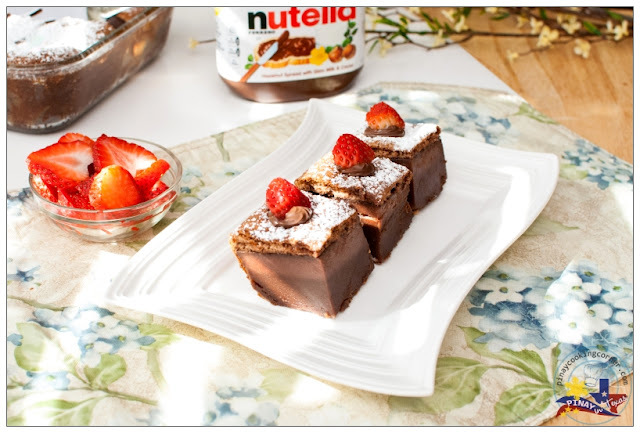 But when I found the Nutella Magic Cake at Kirbie's Cravings, I knew I have to try it! You see, we're big Nutella fans in this family. We eat it with toasts, bagels, pancakes, waffles, crepes, crackers, ice cream, strawberries, bananas, and even apples. We bake with it, make desserts with it, use it as a dip...and sometimes, we would just eat it plain on a spoon. It's just so good and addicting, you know! And the thought of how yummy a Nutella Magic Cake could be, was enough to make me jump on the Magic Cake bandwagon! I've read that some who have tried the original version think that it tastes like a chiffon cake lacking flavor...so I'm glad I made the Nutella version. At first, I was afraid that I will end up having only two layers as what happened to some. I was looking through the sides of the baking dish, and all I could see are two visible layers...but when I sliced it, there were indeed 3 layers! It was so awesome and beautiful to look at! And the best part is --- IT WAS SO DELICIOUS! 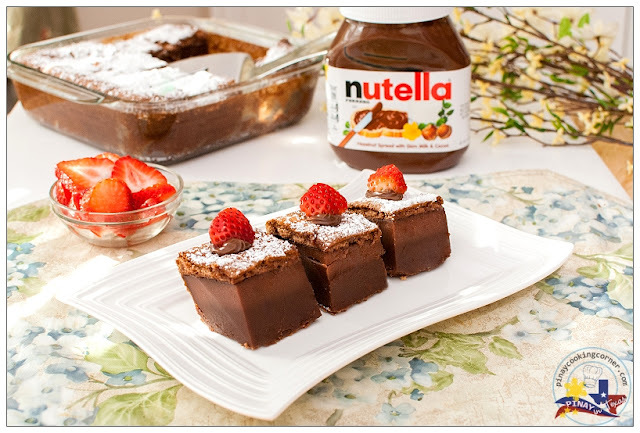 You really can't go wrong with Nutella! 1. Preheat the oven to 325°F. Lightly grease an 8" x 8" baking dish. 2. Whip the egg whites and cream of tartar on high speed until stiff peaks form. Set aside. 3. Beat the egg yolks and sugar in low speed until light in color. Beat in the vanilla extract, melted butter and Nutella until smooth. Add the flour into the batter and continue beating until free of lumps. Very slowly (so it won't splatter everywhere) add the milk and continue beating until everything is well incorporated. By the time you finish, your batter will be very liquidy. 4. 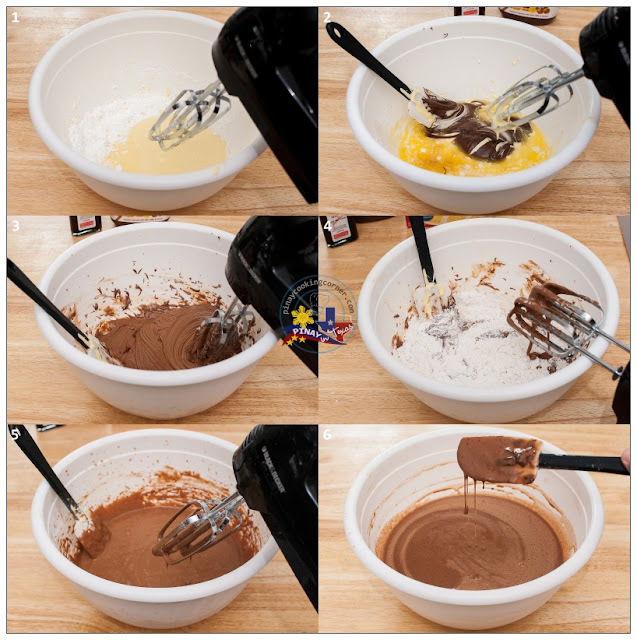 Using a spatula, fold in the egg whites, 1/3 at a time, trying to mix in as much egg white as possible into the batter. 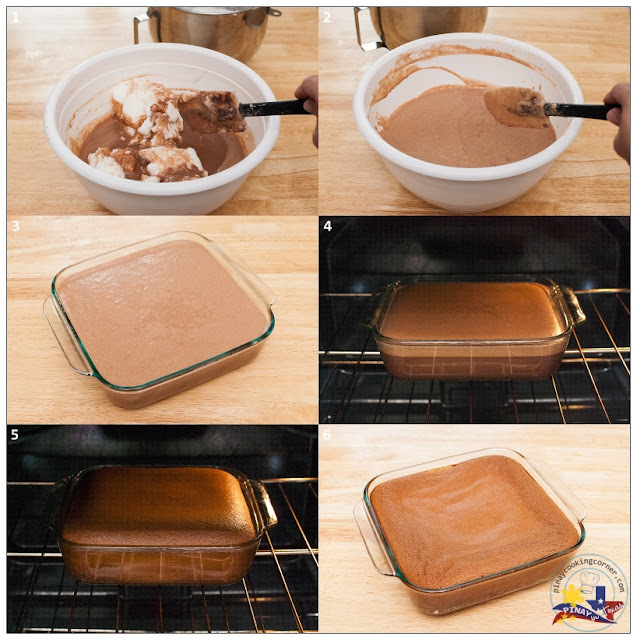 Pour the batter into the prepared baking dish and bake for 55-60 minutes. When you move the cake, it should shake slightly from the custard layer. If it moves too much, then the custard is not yet set. If you aren't sure if the cake is completely finished, insert a knife or toothpick and pry a little slit into a small section of the cake until you can see the custard layer to check. Turn off the oven. Leave the cake in the oven for 10 minutes (with the oven door slightly opened) so that it can shrink slowly before you take it out. 5. Let cake cool completely (at least an hour) before cutting and serving. 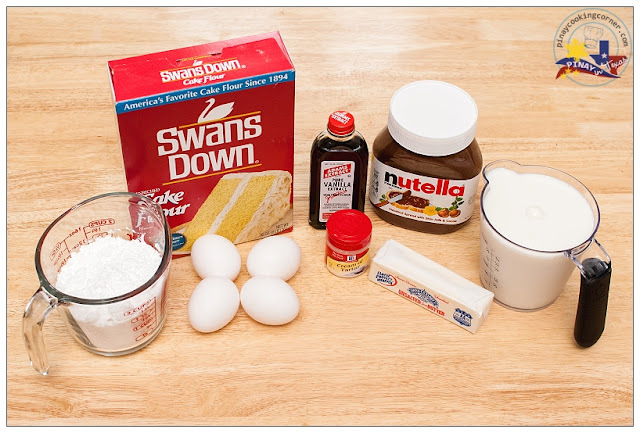 Sprinkle some powdered sugar after cake has cooled. Betty Ann, it's actually a lot easier to make than sapin-sapin because this Magic Cake makes layers on its own! It's sooo amazing! oh. my. goodness. Anything with Nutella is good by me, but this should just be illegal haha. That looks soooo good! This looks so tempting.seen too many recipes of magic cake around the web, but yours seems to be perfect with three layers. What a delicious idea was to add Nutella! Looks yummy! I am not big on nutella neither on desserts. But I am a big admirer of the cakes and desserts you make. Here's to the nutell magic cake that is so lovely, inviting and wonderfully presented. This is a must try for sure...nutella can never go wrong!! I think I just actually drooled? haha! I have been craving for chocolate and I think this magic looks to be the answer! Thanks for the share! Awesome. Love the cake. Bookmarking it. Why are pics not showing? except the first one none show up. I tried refreshing too. Maybe your something is blocking it from your browser Archana. =) Try checking the settings. Great dessert love everything with Nutella...great dessert Tina.